No idea where you're located, but if you're in an area that has Meijer, they have the best deal on the litter this year. The posted PetSmart ad is a preview. I expect there will be more. Well.... I seem to remember that they had a morning time special, 7-12 maybe. And that prices went up after that. So I'm thinking this is the after noon time ad. I went and checked last year... Cat litter was $8.99 before noon. And $9.99 after noon. The ad was 7 pages long. But, all through the ad they had product with the different prices/times marked, and not separate pages. So I dunno. Guess we'll have to see. But, having the preview up on their site is already allowing a large number to view it, and a lot of people may not think to check for a different ad, and cross them off their list completely. The cat litter has gone up $1 each year for the past couple years! Right now Target has a deal where it's the same price shipped to my door at PetSmart on BF. I'm sure my UPS guy would hate me though if I ordered 8 tubs shipped to my house! And no Meijer, sure miss that store! I gave up on TC last year and only use Fresh Step. Stocked up at PS last BF and they all had 5 off coupons on them. Much better Litter! Pet Supplies Plus is selling Tidy Cat for $8.98 this Friday only (ad says that's $8 off so almost half price.) Lots of other great deals too, like buy one, get one free. 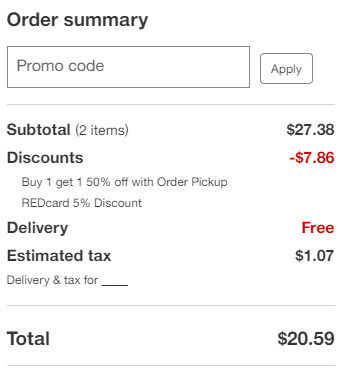 2 pails for $19.52 ($9.76 each) at Target right now online with store pickup (Buy One, Get One 15% off @ $13.69 each) & Red Card. Disclaimer: If you do this, you'll miss out waiting in the PetSmart checkout line for 60+ minutes (if you've never been on BF, I'm really not exaggerating) ...so if that's your tradition, go ahead and stick to it. Thanks for doing that math! I saw that deal, but was too lazy to look up the regular price! I'm not sure though Mama will be willing to give up the pet smart tradition... We head there after we get the batteries and poinsettias at home depot. YES! As is the Petco IMO. I always get several bags of dog food because they are a super price, and nothing this year. I'm so surprised that there was no subsequent ad released. The ad here and on their site does not even list the time the store opens or any other info. I really thought another ad was coming that would include more (much more!). Really disappointing. I'll try to stop into my local PetSmart tonight to see if they've got anything beyond what we've got posted. That would be great of you. Thanks in advance for sharing your recon with us. Don’t feel bad though if things change and you can’t get there tonight after all. It has gone up over the past several years, but...$1-$2 extra a tub is really messing y’all up? I know every dollar counts sometimes, but it’s still cheaper than it is all year. Plus, as is on the ad, you can buy online at BF prices and pick up in store this year. No lines for that!! For me, it’s not cheaper at $9.99. I regularly get the 14lb jugs for $2 or less using coupons during Super Doubles at Harris Teeter. This equates to $5 for a 35lb bucket, which is half the price PetSmart is charging. With 5 cats, litter deals are a must! I never made it to PetSmart on BF. Did they end up having better sales than were listed in the linked ad? Just curious. Thanks! Nope. That was it. And the store was fairly dead too, go figure. Up until 7:30 there was no one in line. At 7:30 there were about 5-6, and they opened a 3rd register. Because they had the extra people to do it! Normally by about 7:15 the line is at least halfway to the back of the store. Wow, that is a huge change from last year. I went to PetSmart 3 times last BF and turned around and walked right back out the door because the line wrapped around the back of the store each time. Ended up ordering what I wanted online last year because it was so busy. I wonder if they took a big enough hit to their profits that they might change things back to the way they were in the past. It will be interesting to see what they put in next years ad. Their sale was really weak this year. No cat furniture on sale, really, litter deal was not the best deal, depending on what other stores folks had available to them, no "first X # of customers through doors get coupon/gc/whatever" etc. Petco beat them on some things, too. I skipped Petsmart. Went to Pets Supplies Plus instead. 50% off all cat furniture and scratching post, 50% off Sheba multi packs (My cats favorite) and Tidy Cats litter 35 lb $8.99. Temptations treats (big bag) buy one get one free. Super sale. All the cat/dog toys were buy one get one free too.